Civil War is a 2006-2007 Marvel Comics crossover storyline built around a self-titled seven-issue limited series written by Mark Millar and penciled by Steve McNiven, which ran through various other titles published by Marvel at the time. Civil War #2 was the second-best seller of the decade behind the famous Amazing Spider-Man #583 the Barack Obama commemorative issue. 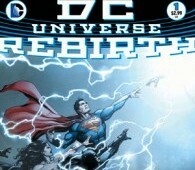 This $2.99 comic sold over 341,900 copies. This is outstanding for any comic book publication, and with total sales, the 7 part Civil War sold more any limited series in the past decade. The reason for this was the story unmasked Peter Parker as Spider-Man to the whole world because of the Superhuman Registration Act supported by Iron Man (Tony Stark) and other heroes that were willing to reveal their identities to the public to satisfy the new law which required the mandatory registration of any person based in the United States with superpowers. This was a monumental decision by Peter Parker and caused him nothing but trouble in future storylines starting in Amazing Spider-Man #533. Peter realized that this was a bad law and eventually came to fight with the resistance led by Captain America. He realized that the Government and heroes sympathetic with the law could not protect him and his family 24/7. All he did was put those he loved in jeopardy. The prospect of registration divided the superhuman community down the middle, with Tony Stark, the superhero Iron Man who had previously tried to halt the action, becoming the pro-registration figurehead, and Captain America leading the anti-registration group. Iron Man, with Mr. Fantastic and Henry Pym, argued that the changing political landscape meant that resisting the law was pointless, and that it is reasonable for heroes to have proper training and oversight, whereas Captain America, alongside Luke Cage and Falcon argued that heroes required secrecy in order to protect aspects of their ‘normal’ life, such as wives and children, and to allow them to act in whatever means necessary against threats which the ordinary emergency services couldn’t cope with. Civil War was well written and thought out and the art was outstanding and the biggest of the annual mega story series that Marvel seems to do every year in this century. They have not matched the success of the 2006 story arc. 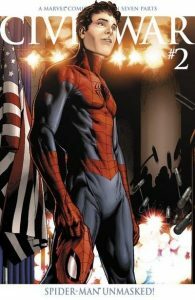 Because of that fact and the Spider-Man decision to reveal his identity this earned Civil War #2 as one of the Greatest Comics of the 21st century. was written within the Spider-Man titles. 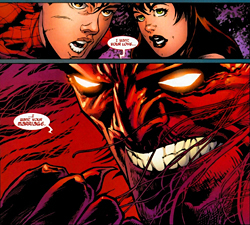 With Aunt may dying from an assassin’s bullet Peter and Mary Jane made a deal with the devil (Mephisto) the Marvel version of the devil that is. Mephisto tells Peter he can save Aunt May, but as payment, Mephisto wants not Peter’s soul, but his marriage to Mary Jane. Peter and Mary Jane are given until midnight the following night to decide their answer. They agree to the deal, as long as knowledge of Peter’s secret identity is erased from the world. Peter Parker now has no memory of his marriage to Mary Jane and Aunt May is alive. Though the events in this story arc and a later story in 2010 called “One Moment in Time” It explains the whole story and how it happened. This was a very controversial story to make Peter single again, but who knows what the future holds.